The installation of iGrabNews goes just as any other program. Just open the .dmg file you downloaded from the iGrabNews website and drag the iGrabNews icon to your Applications folder. This was really easy, let's continue with the configuration. When you start iGrabNews for the first time, you will see this screen. First I will briefly explain the different sections of this screen. On the left-hand side of the screen we see two fields, 'Servers & Subscribed Groups' and 'Activity and Stats'. The first field, which is still empty, will display our news servers and newsgroups. The second field displays some statistics about the current state of the program like download speed, the number of files remaining to be downloaded and the estimated time to finish downloading. For now all values are still 0, but this will change once we start downloading. On the right-hand side we see a large screen which displays three tabs. 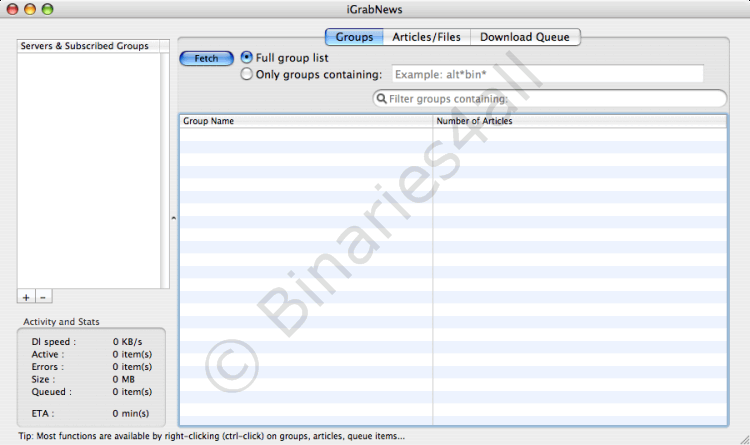 The first tab, 'Groups', is the tab where the available newsgroups belonging to a server will be displayed. 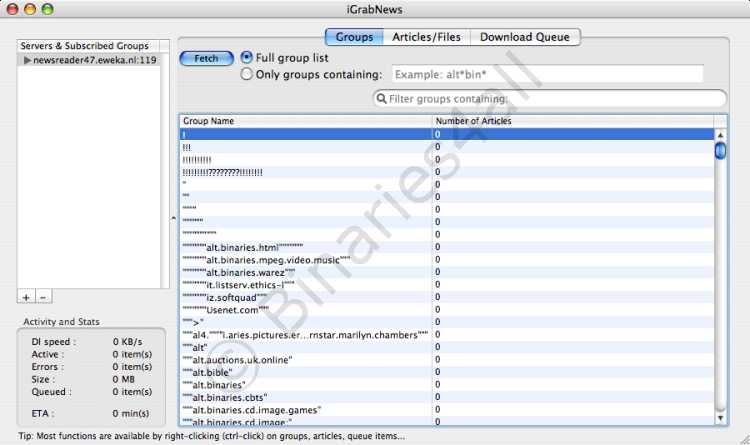 The second tab, 'Articles/Files, displays the headers in the selected newsgroup. And finally the third tab, 'Download Queue', shows us the files that are queued for downloading. Later on in this tutorial I will discuss these tabs in more detail. For now let us proceed with the configuration of iGrabNews. 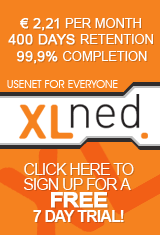 To be able to actually download posts from Usenet, we first have to add a news server. To do so we ctrl-click in the field 'Servers & Subcribed groups'. A context menu appears en we choose the option 'New NNTP Server'. 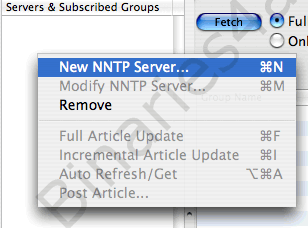 We could have also used the shortcut Command-N or we could have chosen 'New NNTP Server' in the 'Servers' menu. Once you have chosen 'New NNTP Server' a new screen appears. This is the screen where we have to fill in the settings of our news server. A you can see a news server was filled in already, but this is not the one we are going to use. In the 'Server Address' field you have to enter your own news server. 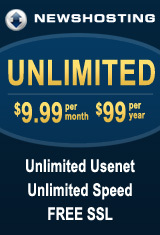 For example the news server of your ISP (if your provider has one) or a payserver. In my case it is the Dutch payserver Eweka. Normally you don't have to change the 'Server Port' as this is the default setting. 'Max connections' is the maximum number of connections that you are allowed to make with your news server. In my case that would be 4. Let us proceed to the 'Authent' tab. For payservers you usually have to provide a username and password, this is the place to do so. In case you do not have to provide any username or password, just uncheck the 'Nntp Server Requires Authentication' option. When you filled in everything, click on OK. In the field 'Servers & Subscribed Newsgroups' the news server we just added is now displayed. To check if we succesfully added our news server, we will try to fetch the newsgroups list from the server. Click on 'Fetch' with the 'Full group list' option selected. This is the way to retreive the group list from the server. At first sight nothing seems to happen. However, if you take a look at the 'Activity and Stats' field, you will see that iGrabNews is actually downloading. And just a little bit later the newsgroups are being displayed in the 'Groups' tab of the main view. Now we know for sure that we have succesfully added our news server. In case that something went wrong, ctrl-click on the newsserver an choose 'Modify NNTP Server'. Double check your settings and try again. If you have multiple servers to set up, just repeat the same same steps for each server. iGrabNews also has a limited configuration panel. The only things you can change are the location of your download and cache directories. 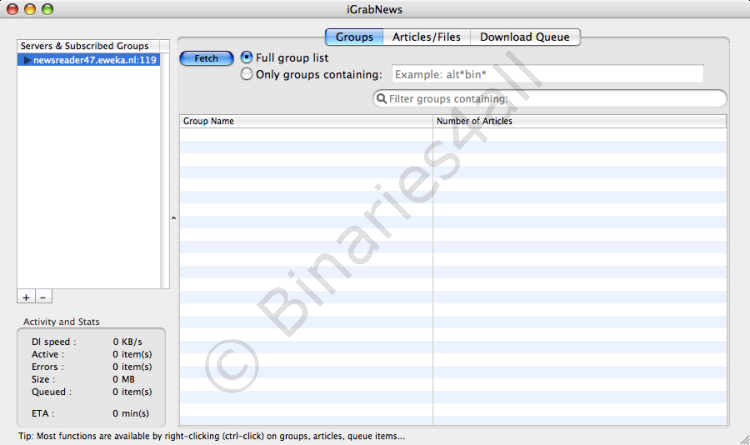 To open the configuration panel use the shortcut Command-, or choose 'Preferences' in the 'iGrabNews' menu. The download directory is the folder where all downloads will be placed. The cache directory is the folder where the temporary files, which are created during downloads, are created. The temporary files will be deleted when a download is complete. It is important for these folders to exist, otherwise iGrabNews will give a bunch of errors while trying to download a post. This was the configuration of iGrabNews. In the next chapter I will discuss the most common way to download a post: downloading using NZB files.